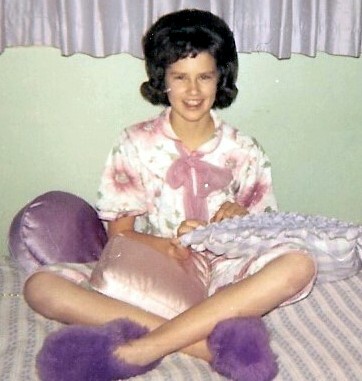 My plan is to feature real-life sixties fashion photos from anybody who’s willing to share them. If you’re nervous the photos might be embarrassing, study the photo above left – myself at roughly age ten – I dare anyone to get any geekier! The flip, the pajamas, the slippers, the pillows (??!?) Sadder still, this was a relatively GOOD hair day for me. The sixties was one long bad hair decade. I’m going to divide the sixties fashion section into three parts – early, mid and late. If you want to add your photos to any or all sections, just email me or post here and tell me what (if anything) you want as a caption for your photo(s). Sorry to start out with so many of myself but I’m relying on the kindness of strangers to supplement my meager gallery – until they do, it’s all I’ve got. As my fellow baby boomers recall, this was long before digital film and selfies -consequently, a disconcertingly large number of photos are in black and white.